In our practice, we often need to shoot several interviews in a single day. The number can be as high as 7 to 8 people or more. If we had to change locations for each of those interviews, it would be impossible to get it all done in one day. Setup, shoot, breakdown, transport, repeat – several times. Therefore we often set up a green screen on location. We can put any background behind the interviewees later in editing. It’s easier on the business since we aren’t traipsing through their offices disrupting the work flow. It’s easier on the interviewee because they simply walk in, sit down and talk. And it’s easier on the budget since we can get it all done in one. 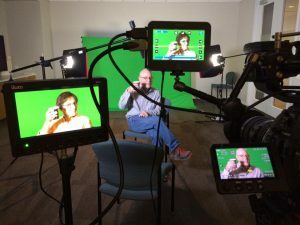 There is an increased cost in editing since fine tuning a green screen composite can take time but it’s still far less expensive than adding another day of shooting.